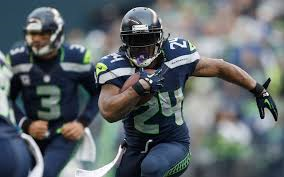 Seattle running back Marshawn Lynch outscores 16 NFL teams in Week #10! Seattle running back Marshawn Lynch had four touchdowns in the Seahawks 38-17 win over the New York Giants last Sunday. Not only did Lynch outscore the entire Giants team with his 24 points, but he also outscored 16 of the 26 NFL teams that played in Week #10 (he also had the same number of points as two teams). Lynch became the second player this season to score 20 or more points in a game. In Week #9, Minnesota running back Matt Asiata had three rushing TDs and a two-point conversion to give him 20 individual points in the Vikings 29-26 win over the Washington Redskins. Here’s a look at the last 10 NFL players to score 20 or more points in a game. For Lynch and the Seahawks, he was the first Seattle player to score 20 or more points in a game since Shaun Alexander scored 24 in a 2005 contest. Thirty-one of the 32 NFL franchises have had at least one player score 20-plus points in at least one game in franchise history. The lone team that has not? The Houston Texans. Here’s a look at the last year a player scored 20-plus points in a game for each NFL team. * Only two players in the Super Bowl era (since 1966) have scored 20-plus points in a playoff game. Blount did it in a playoff game last year for the Patriots; Ricky Watters had 30 points for the 49ers in a playoff game in 1994 (1993 season playoffs). * Fifty-one players have scored 20 or more points in an NFL game since 2000. Teams were 49-2 in those games. * Gale Sayers holds the NFL mark with 36 points scored in a game. He did it in 1965. Green Bay Paul Hornung had 33 points in a 1961 contest. There have been 11 players who have scored 30 points in a game.